CHESTER, PA — (Tuesday, June 5, 2018) — The Richmond Kickers run in the 2018 Lamar Hunt U.S. Open Cup came to an end Tuesday night in the Fourth Round at the hands of Major League Soccer’s Philadelphia Union. 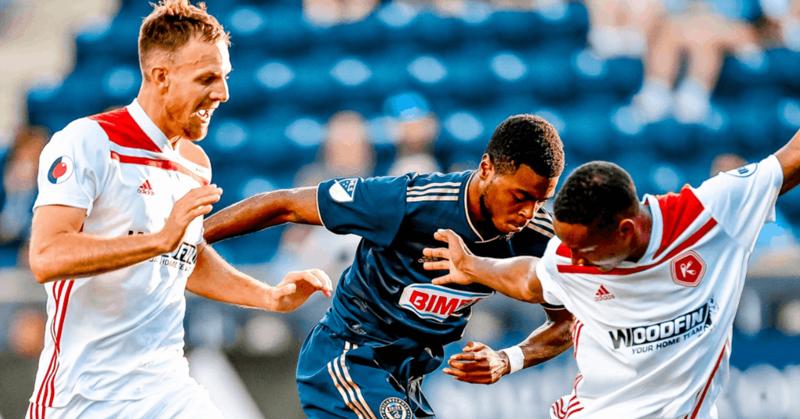 The Union took a commanding lead in the first half, finding the back of the net on four occasions behind goals from Jack Elliott, David Accam, Anthony Fontana and Marcus Epps. Jay Simpson added the fifth and final goal four minutes into the second half to seal the victory for the home side. The Kickers got behind early with Jack Elliott putting the home side up just after four minutes. Trevor Spangenberg was forced to concede a corner kick as Cory Burke looked to play a cross in front of goal. Haris Medunjanin came over to take the corner, sending over the head of Spangenberg. Elliott came in to tap it in for the opener. Trevor Spangenberg was called into action again, making a goal line clearance in the 17th minute. Haris Medunjanin set up a corner kick form the opposite side of the field than he had luck with earlier in the match. He was able to pick out Cory Burke at the top of the six yard box, forcing Spangenberg to act quickly and got a hand to the ball on the line, followed by Mekeil Williams clearing it out of danger. The Union doubled their lead in the 27th minute as David Accam converted a penalty kick. Cory Burke found space in behind the Kickers backline. Spangenberg was forced to come off his line to try and make the stop as he appeared to make contact with Burke, drawing the penalty. Accam stepped up and put his shot to Spangenberg’s right and into the back of the net. Matt Bolduc looked to create an opportunity in the 38th minute to get Richmond back into the match. Receiving the ball out on the left wing, Bolduc pushed forward using a little fancy footwork to get between Keegan Rosenberry and Haris Medunjanin. As he got into the Union box, Jack Elliot managed to get a foot to the ball to prevent any shot on goal. Philadelphia would get a third goal just two minutes before the end of the half from Anthony Fontana. Fontana found space to get into the Richmond box and took a shot towards goal. He shot took a deflection off a sliding Brandon Eaton and into the goal. Into stoppage time, Marcus Epps found the back of the net to give the Union a 4-0 lead just before halftime. Cory Burke back heeled the ball to Epps at the top of the Richmond box. Epps took a one-time shot to get it past a diving Spangenberg. The Union kept the pressure on in the second half, finding a fifth goal from halftime substitute Jay Simpson. Marcus Epps controlled the ball up the right side of the field. At the end line, Epps took a touch to get around Scott Thomsen and squared a pass for Simpson. He just needed a touch to tap it in. Richmond would find an opportunity to pull one back in the 76th minute. Raul Gonzalez was brought down about 30 yards from goal setting up a free kick. Both Gonzalez and Scott Thomsen stood over the ball, with Thomsen sending the ball into the box trying to pick out Mekeil Williams. Derrick Jones rose to head it away and out to the feet of Fred Owusu Sekyere. He went for the shot right away from about 35 yards out as it sailed high. The Kickers return to USL action this Saturday night, welcoming longtime rivals, the Charleston Battery to City Stadium for Kickers Fiesta. The party starts at 5:30 pm with live Salsa music, all-you-can-eat Chicken Fiesta Taco Bar and Modelo on tap for just $22 ($16 for Season Ticket Holders). Tickets are on sale now at RichmondKickers.com.